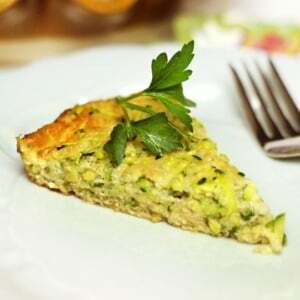 This pie packs a nutritional punch, loaded with vitamins from zucchini and protein from eggs, without the heavy flour or biscuit mix that most traditional recipes require. The result is a light and easy to digest meal, perfect for anytime of the day! Preheat your oven to 350F and grease a 9" pie pan generously with butter. After shredding the zucchini (I used a salad shooter to make the process go quickly), you'll want to squeeze it well in a thin dishtowel, to remove any excess moisture. You should be able to squeeze out at least a couple tablespoons worth of liquid. In a medium bowl, combine the drained zucchini with the rest of the ingredients, and mix until well combined. Transfer the mixture to the greased pie pan, and smooth the top with a spatula. Bake for 30 minutes at 350F, or until the top starts to turn golden brown. Allow to set in the pan for 5 minutes, then slice and serve while it's still hot! Divide the pie into 4-6 large slices, depending on your appetite. Alternatively, you could also bake these in a mini-muffin pan for mini quiche bites! (I found that they are harder to remove from the pan this way-- make sure to grease well!!) For these mini bites, reduce baking time to 15-20 minutes.